Unfortunately, Graeter’s Ice Cream shops are exclusive to the Cincinnati region. 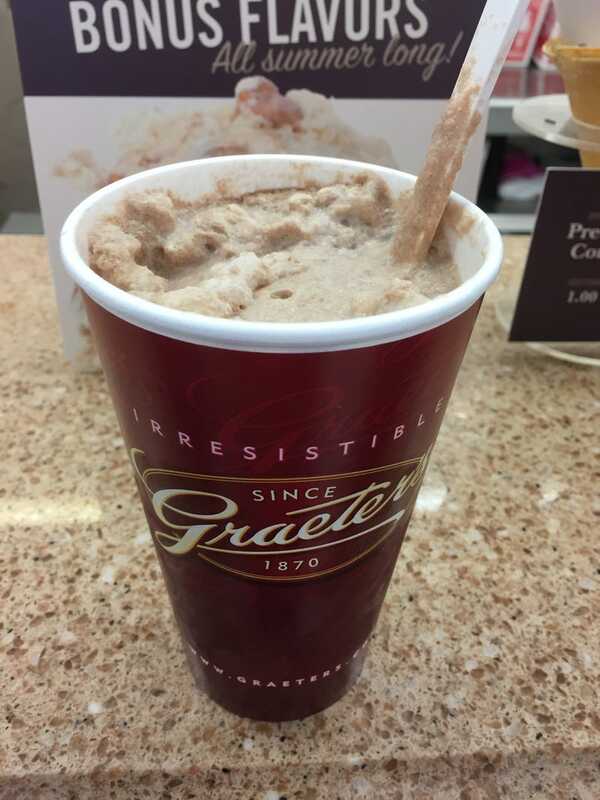 But if you live near there, or are passing through, you’ve got to try Graeter’s chocolate double-dip soda. Back a few years ago, Greater’s called them “Old-fashioned,” which I liked best, and then “Signature,” before finally settling on the boring name “double-dip.” Nevertheless, the taste has remained the same despite the name-changes, and it’s just as good as ever. Now, they have other flavors for the double-dip soda. Some stand-outs are nectar, (as the name implies, it’s a slightly sweet flavor), mint, root beer, and coffee. But you just can’t beat chocolate. After trying all of the flavors over the course of many months, I settled on chocolate, and very seldom get anything else because of how good it is. If you get any flavor other than chocolate, get vanilla ice cream to go with it. That’s the default flavor that Graeter’s employees will use if you don’t specify, and it goes well with all of the rest. But if you get chocolate, as you should, ask to have chocolate ice cream. Vanilla is fine, but chocolate alongside everything else is enough to turn your mouth into heaven on earth. Far be it from me to shame anyone on what size they choose to have, but I’d suggest regular. I’ve never tried large, but it looks like it would become too much of a good thing, and possibly send you into a sugar coma. Sadly, there is no small option, as sometimes I’m not craving even the regular size that would be classified as an extra large in some other countries. You can always share if you think it’ll be too much for you. First, they put two scoops of ice cream into the cup, as the name implies. Then, they pour the syrup you chose into the cup. Then they fill the rest up with seltzer water, and voila! You’ve got your double-dip soda! Soda in today’s world has a different meaning than what Graeter’s “sodas” are. Today, they’re fizzy drinks, usually from cans, that don’t usually taste particularly great, in my opinion. (Except Dr. Pepper. I try to drink it as seldom as possible but sometimes I cave in because boy do I love Dr. Pepper.) What Greater’s means is what I described two paragraphs ago. The two both have seltzer (carbonated) water in them, but the double-dip soda has the carbonation look like static bubbles in the syrup and ice cream, rather than the fizzling and jumping hyperactive bubbles in modern sodas. A lot of people, my girlfriend included, probably don’t like modern sodas because they don’t like the fizzy sensation going on in their mouths and insides. While I have a higher tolerance for it than others, I know what they’re talking about, and that feeling is 100% absent from Graeter’s double-dip sodas. Enjoy it however you want, but this is my tried-and-true method: When you get your soda, take the special long spoon that they give you (very useful since it’s the perfect scooping size and can easily reach into the bottom of the long cup), and a straw. The straw is optional, but you’ll definitely want the spoon. Stir the ice cream around until it’s a nice consistency. There will be some big chunks of ice cream that don’t want to mix, and that’s totally fine. Stirring is to get all of the ice cream to absorb the syrup and carbonation, or at least that’s my theory. At any rate, it makes it taste really good. Eat it the way you’d eat any other ice cream with a spoon, but make sure to get the seltzer water along with the ice cream. Once there’s about one third left, most of the chunks should be gone, and you’ll have a nice consistency throughout. Depending on how you’ve been tackling it, you could start drinking with a straw, or you could keep on using the spoon. But I get impatient. Others like to savor it and have it last, but I just tilt the cup toward my mouth and drink it that way, albeit slowly. It’s a perfect finale of almost overwhelming flavor. I swear I’m not exaggerating on this: I sometimes get tears in my eyes because of how good it is. The double-chocolate whammy combined with the seltzer water bringing out the flavor (sidenote: I have no idea what “bringing out the flavor” means, but I hear the critics on Chopped say it a lot so it must mean something good) creates such an intense chocolate flavor that it might turn some people off, but it’s not decadent. It’s hard to explain in words, but something like a chocolate cake can be too decadent to the point where it can be too much, but Greater’s double-dip sodas are intense because the taste is just so strong. It can get to be too much in the mint, nectar, coffee, etc. flavors, but nobody I know that’s actually tried it (my girlfriend does not fall into that category) has ever found the chocolate one to be too intense. Chocolate is just such a universally-loved flavor, especially in ice cream, that our tolerance for it is very high. That said, if you don’t like Graeter’s chocolate ice cream, you probably won’t like the double-dip soda, but that’s a bit redundant since, you know, the double-dip soda is basically chocolate ice cream with other stuff thrown in. You can get a double-dip soda or whatever they call it at UDF, but it’s nowhere near as good for two reasons: 1) UDF’s ice cream is fine, but it’s nowhere near Greater’s quality, which I suppose is to be expected because Greater’s is a local business whereas I believe UDF is nationwide. 2) The double-dip soda equivalent is on the menu, but seldom requested at UDF. This means that the employees often take a very long time to make it, and it’s not as well put together as those from Graeter’s. It’s still okay, but I personally prefer a normal shake or malt from UDF to a double-dip soda. If you don’t live in or near Cincinnati, check out any local ice cream shops and see if they serve double-dip sodas. They might not have the name, but if you’ve read this far, you should be pretty knowledgeable on what you’re looking for. Or, if you’re feeling adventurous, you could try to make your own! I’ve never felt the need to, but in theory all you’d need would be ice cream, seltzer water (which you can find at most grocery stores), and the syrup. Finding the right syrup would probably be the hardest part as I’m not sure if Hershey’s chocolate syrup would do the job, but hey, it’s worth a shot!